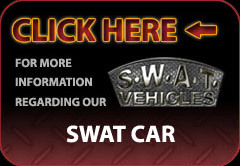 What differentiates your SWAT cars from other makes and models? Our police SWAT cars and the rest of our SWAT armored cars are differentiated by their superior engineering and advanced design. We also offer a great line of armored trucks, armored vans, armored transport including prisoner transport vehicles, and more. In short, you'll find the most comprehensive line of armored vehicles anywhere in the market today. Learn more about our company and the amazing line of products we offer customers just like you every day. All rapid deployment and tactical vehicles are not created equal. Our reputation is built upon a line that sets the standard for engineering and design. Choose from an inventory that includes SWAT armored cars, Police SWAT cars, armored vans, armored transport and prisoner transport vehicles, and much more. See the difference attention to detail makes, and acquire a vehicle built for the type of performance you expect and need. When you choose one of our models, you choose from the line with a reputation for the highest standards of performance. With a line that includes SWAT armored cars, Police SWAT cars, armored trucks, and more, you're sure to find what you need in our versatile line of armored vehicles.